May 2016 marks the 42nd anniversary of EMS week. 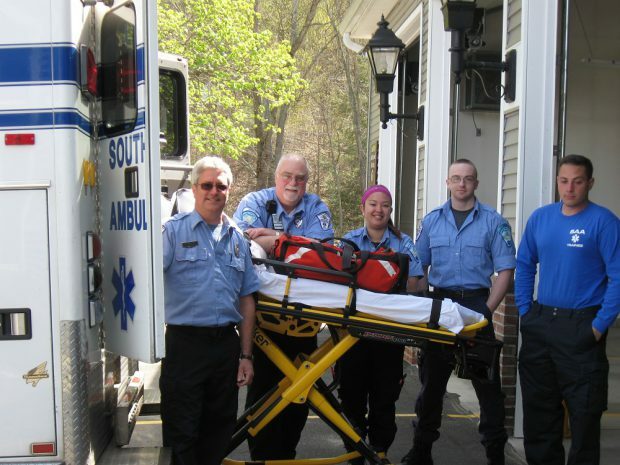 In Southbury and throughout the nation, EMS workers are relied on as an integral part of our healthcare system providing the frontline of care in emergency medical situations and transporting to local area hospitals. Working in EMS requires certification and is physically demanding and stressful. Over the years the demands and requirements placed on EMS workers have increased. EMTs perform initial assessment, transport to medical facilities, monitor the patient during transport, and remain with their patient until care is transferred to the next level. In EMS the priority is always high quality patient care. In the past, especially in smaller towns, EMS personnel were primarily volunteers. This trend has been changing as nonprofit ambulance services struggle to recruit and retain volunteers. In addition with the number of EMS calls increasing along with the EMS equipment requirements, many ambulance services supplement with career EMTs and paramedics. EMS is unique in that medical services are provided without knowing what reimbursement will be received. The cost of running a nonprofit ambulance service is high, but the cost of not having the service is much greater. May 15th through May 21st has been designated as EMS week. During this week please take a moment to think about the amazing service that EMS workers provide. Each one of us hopes not to need to call the ambulance, but here in the Southbury community each citizen knows if they call 911, the ambulance will respond quickly and professionally. Please consider joining Southbury Ambulance as a volunteer or if volunteering is not possible, any donation would be appreciated. Thank you.